With a Great Britain rifle shot who is also a part-time gunsmith as a key member of the team it is hardly surprising that Gifford Grant has a shooting based corporate entertainment subsidiary. 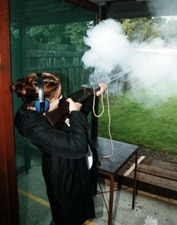 Whether you are looking for a challenging team building day or a fun way to entertain your clients, why not try shooting sniper rifles over 1000 yards, clay pigeon shooting or both. Gifford Grant will organize an event to remember. These days are tailored to your budget and requirements and can include fabulous lunches and/or dinners at one of the authentic on site ‘game lodges’ at Bisley in Surrey. Coffee and bacon rolls before the shoot are always a must! In addition to this, Shooting Services also provides a gunsmith service for the more experienced shot needing a new firearm or wishing to modify an existing one. Ian Brown is a highly experienced licensed gunsmith who would be pleased to discuss your requirements with you. Contact us.